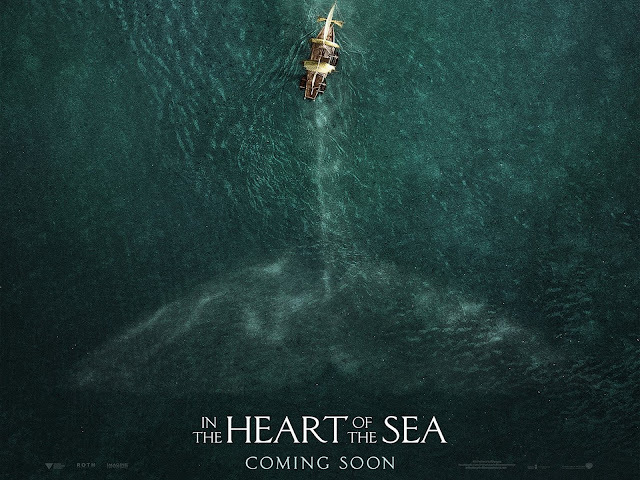 Today, December 9 2015, I asked my boyfriend to watch the movie titled ‘In the Heart of the Sea’. It is shown at the cinema in Indonesia at December 2, 2015. The first time I saw the poster, I interested to watch it as soon as I could, because the poster shows the eye of the whales which has the same size with a man. Therefore, I predicted that this movie would tell about whales. Well, my prediction is quite right, because the whales is like the climax or the main problem in the story. In The Heart of The Sea is the movie based on the novel by Herman Melville. It was a great novel that America has when it was published in 1851. Moreover, it based on the real story about Melville who obsessed with the reason of the Essex drown. Personally, I as Indonesian people who does not really know about that novel, only interested in the big whale that appear in the movie. However, maybe it is different with American that is really well-known about the story that Melville wrote. The movie that I watched, can tell what the novel about, how he get all the story, and what the meaning of his story are. The movie tells about Melville who obsessed with the real story of the Essex. Therefore, he came to one of the survivors named Thomas Nickerson. At first, he did not want to tell the story about what happened to the Essex even though Melville gave his all own for trade with the story. Because of Nickerson’s wife persuasion, he told the real story that happening to the Essex and Melville began to write it down. Nickerson told everything that he had been through when he was on the ship. He was 14 back then, and it was the first time he was on the ship, Essex. However, the story that he told is about Owen Chase, the first officer who extremely has an experience in hunting whales, and George Pollard who was chosen as a captain because of his blue blood. He told all the barriers that they had on the ship. One month, they got a storm that almost made them drown, then when a gigantic whale attacked them and crashed the Essex. Moreover, they had to survive in boats with a few supply hoping that they would find a land or some ships helped them out. Most of the scenes shows how they survive. After 90 days drifting, there were some ships found them and helped them. That’s the story that Melville wrote with using different names for the survivors and made it a fictional novel. From the movie, we as a person who do not know anything about Melville or the novel, suddenly know the story that actually has written a thousand years ago in the novel. From the movie also we can know the Essex and the survivors. They are real, because in the poster shows the words written “Based on True Story”. Therefore, not only entertaining us with some actions, acts, and graphics, but also informed us about the Essex and a white whale that caused the Essex drown. It was such a great that movie. It has a meaning that we as human not to be greedy, selfish and banish the nature. Whales are the creature that God made. We should not kill them for our own priorities. It shows that humans are monster. They cheers for the deaths of the whales that are not disturb their life at all. Therefore, God cursed them by starved, abandoned, and far from home. So they can think their mistakes and not doing the same mistakes again. Whales are also creatures that need place to live. We should not disturb their life or destroy their populations. If nature has angry to us, we should accept it, because we are the reason why nature is mad. Great meaning and great story can make this movie to be a winner in Box Office Movie’s Awards. I love how the movie represents the story in the novel, and the story of Melville itself. I who do not know about Melville or either Essex becomes know and curious about the real Melville and the novel itself. Just noted that this movie must be in your must-watch-movie list. You will not disappoint to watch it.